How do I purchase OceanSolution®, and how much does it cost? To order OceanSolution®, click here. Yes, click here to see our CCS. 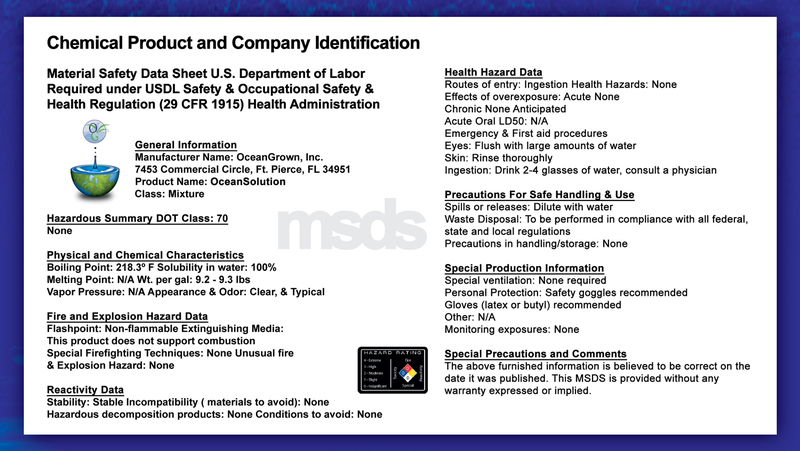 Do you have a Material Safety Data Sheet (MSDS)? Yes, click here to view it as a PDF. Yes we do. Please advise us of your quantity and your city and country and we can get you an accurate shipping quote. Click here to send us an email. What is the shelf life of OceanSolution®? We believe that un-opened it will be indefinite, but we are doing long term stability testing to verify shelf life. We recommend storing the Solution in a cool, dry, covered area. Once opened it is suggested that the contents be used within 2 years. How is your product different than other Sea Minerals Water companies? What makes our product different from others is that we go to great pains not to tamper with the element-to-element proportionality. Other products on the market use precipitative means to remove almost all sodium chloride. Sodium is the element that controls osmotic pressure which enables the transportation of nutrients through semi-permeable membranes (cell walls). When a person is taken to a hospital’s emergency room, one of the first things the hospital does is hook that individual up to an IV saline drip. This is done for the same reasons why we leave the sodium chloride in our product: to enable the transportation of minerals across cell walls and in the case with humans, transporting medicines. In addition, OceanSolution® has 3 different types of aerobic bacteria… two of which fix nitrogen at the rate of 40lbs/acre/year. How do I know it works, and is a good value? See our Testimonials to read what people have to say about OceanSolution® and the crops grown with it. How can seawater be used to grow any type of plants — doesn’t the salt in OceanSolution® hurt plants? Our process is naturally balanced so that it will not hurt plants — unless it is applied excessively. The salt is a necessary part of the solution as it readies the plant for element uptake and assists the transportation of said elements throughout the plants stems and leaves through a process called osmotic pressure. Although ocean water, which contains all of the known natural elements (which are inorganic), is not nutritionally beneficial for humans, when these elements are extracted properly from ocean water they are viable for plant intake. Plants add a carbon atom to the extracted inorganic elements to make them organic and therefore fit for human consumption. Does diluted seawater help plants grow healthier? The soils of the entire world have become severely de-mineralized by rain and erosion over thousands of years. Plants require a continuous intake of minerals, just as we do and for very similar reasons – calcium to build structural support, iron to carry oxygen, and so on. Plants growing on mineral-depleted soil do not obtain enough nourishment; therefore, they are less-abundant, more vulnerable to the insects, worms and fungi that prey upon them, are incapable of growing to their full genetic permissible size and are unable to deliver the full spectrum on nutrients allowed. Micronutrients (required by plants in trace amounts) can be described as catalysts that activate enzymes. They play a specific role in plant growth, development and yield. Dr. Murray discovered that the relative ratios between each and every element remain the same regardless of the ocean from which a sample is sourced. It is these relative ratios that are so crucial to the proper balance in OceanSolution® which facilitates the optimal nutrient uptake by plants. An excellent example is a tomato which is genetically designed to uptake 56 of the 90 elements. The typical commercially raised tomato rarely yields more than 3-6 elements, such as NPK, and those grown on organic farms generally offer no more than 20 elements. Organic growers are more focused on avoiding chemical inputs and although they are able to offer more nutrients than commercially grown products, they are still lacking the full spectrum of elements tomatoes require. With OceanSolution® you can restore all of the required elements plants need to deliver the maximum level of nutrition to those who eat them. I am on a salt restricted diet; will that affect whether I can eat food that has been grown with OceanSolution? Salt that has been processed (like common table salt) is inorganic, and generally harmful to your body. However, salt that is processed through plants is not toxic or harmful, because plants convert inorganic salt to organic salt. Dr. Maynard Murray stated that sodium in the organic form is “buffered” by surrounding elements in the plant to the extent that, as a practicing doctor of internal medicine, he allowed his heart patients to eat as much celery (known to be high in sodium) per day as they wished — realizing that just one stick a day is all that the body requires to function properly. Humans have yet to find a way to add the all important carbon atom to inorganic elements; we still must rely on living plants to do this for us. However, check with your doctor to obtain their opinion. How do you make OceanSolution®? This is proprietary information. We can say that it is done without heat or chemical processing. No chelates are used. What are the names of all the identified elements in OceanSolution®? 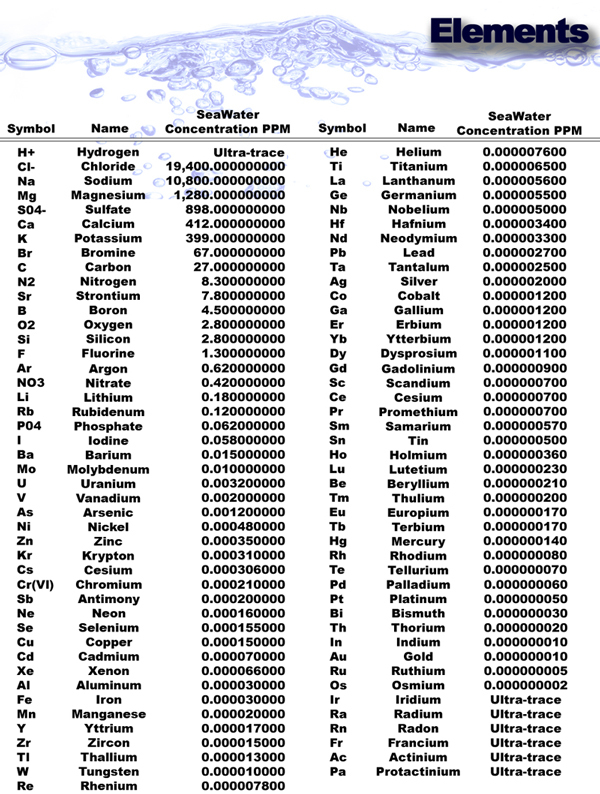 See our comprehensive chart that lists all of the elements in OceanSolution®. Why is OceanSolution® now marketed in a liquid form instead of in crystals as discussed by Dr. Murray in Sea Energy Agriculture? Dr. Murray began his trials with sea solids after he started with coastal waters that had become increasingly toxic and unusable. OceanGrown® has shifted from using sea solids (crystals are problematic for several reasons: many elements are lost during evaporation, crystals do not go back into solution easily or reliably, they are difficult to apply and are a natural desiccant and therefore tend to clump in humid environments) back to an improved OceanSolution® extract harvested from the deep clean ocean and suitable for all plants. This has required major investment in the design of machinery that could extract the minerals without damaging the aerobic bacteria that is abundant in seawater and is important for fixing nitrogen and revitalizing damaged soils. One advantage of extracting the minerals is the reduction of all handling, storage and shipping costs. The first 15 meters of ocean water, especially in the Gulf of Mexico, are often tainted with ciguatera toxin. How do you make sure that the toxin is not in OceanSolution® and how deep do you go to obtain your seawater? It certainly is a concern today as coastal collection is no longer viable due to human pollution such as the dumping of toxic chemicals, agricultural run-off, fresh water skewing, disposal of sewage and anaerobic bacteria into the oceans. OceanGrown® takes great efforts to extract elements from pristine ocean water far offshore and away from possible sources of contamination. Our lab test for 70 violate chemicals. The report comes back non-detectable down to 0.5 parts per billion on all 70 toxins. It would be difficult today to find drinking water this pure. What is the difference between your product and full spectrum salt (like Himalayan or Celtic sea salt) that is diluted in water? The ponds for drying Salts are open to both known and unknown environmental contamination. In addition, the drying process itself, prior to any washing of the salt, naturally separates and leaches out various minerals and alters the basic mineral ratios. Rain washing or natural purification (which occurs even when there is no rain) also takes place. Various elements, mainly magnesium, absorb moisture from the air then dissolve, separate and flow out dissipating into the ground. Once again, this changes the ratio and constitution of the salt. OceanSolution®, besides containing all 90 naturally occurring ionic elements, contains microorganisms and bacteria, azobacter and nitrobacter, which are beneficial to soil and plant health. Plants are living in relationship with numerous microorganisms that fix nitrogen and this process assists roots in accumulating nitrogen and other essential minerals. Plants work synergistically with microorganisms providing food and energy for the bacteria which in turn fix nitrogen from the air increasing the availability of mineral nutrients to plants. Microorganisms have been found to also produce compounds, such as vitamins and plant hormones, that will improve plant health and contribute to higher crop yields in addition to other compounds that stimulate the natural defense mechanisms of the plant to improve its resistance against pathogens. How do you get the salt out of the OceanSolution®? We don't because the salts in OceanSolution® act in a synergistic and beneficial way with the other 90+ elements and natural bacteria in the Solution; they are an integral part of the total nutrition required for optimum plant health. The salt is a necessary part of the solution as it assists the transportation of said elements throughout the plants stems and leaves and enables the nutrients to penetrate semi-permeable membranes (cell walls) through a process called osmotic pressure. Can you tell me what's the PPM of suspended particles in OceanSolution®? The TDS (total dissolved solids) readings for OceanSolution® vary depending on the water source. When mixed as directed, 1 part OceanSolution® to 100 parts Water, your reading will be around 890ppm plus the TDS ppm of the water being used. For example, if the TDS count of the water being used is 50ppm, the total TDS count after OceanSolution® is added will be around 940ppm. How often should crops be nutrified with OceanSolution®? This depends on the type of soil and crop and the stage the latter is in. First, if the soil is heavy (such as clay), we recommend nutrifying only two or three times a year. If the growing area is sandy loam, one could feed the plants daily or weekly. Hydroponically, we feed the roots OceanSolution® twice a day from seedling through full crop. Can OceanSolution® be safely used for foliar feeding? In the majority of applications, yes. However, delicate flowers like orchids should not be fed in this way. Orchids require a dilution rate of 200-1, instead of 100-1, and the mix should be applied to the roots instead. Is it ok to make a solution in a spray bottle to keep in the refrigerator to spray daily? How long would the mixed solution keep in the refrigerator? It is not a good idea to keep your OceanSolution® mix in the refrigerator as this can make the water too cold. Water that's too cold can shock plant cells, shut down water uptake and even kill the plant. A temperature range 55-75 tends to serve our plants comfortably. We recommend you always water them with room temperature water. OceanSolution® will last up to two years at room temperature regardless if it is straight OceanSolution® or premixed with pure water. It is advised to keep out of direct sunlight or extreme heat. I wanted to purchase the 32oz size of OceanSolution® for my garden and if I used the Select 'N Spray No Pre-Mix Sprayer, would it be an easy way to dispense? How much OS liquid would I add to the sprayer? Yes, the Select 'N Spray No Pre-Mix Sprayer would work GREAT with a 32oz container. Basically, you just fill up the container of the Sprayer (which also holds 32 ounces) and set the mix ratio to 2 tablespoons. The sprayer will mix the solution into the stream of water automatically as you spray. It takes the need for accurate calculating, mixing and measuring out of the equation. Will there be an accumulation of salt over time that will slowly become harmful to the soil, or is there a process that prevents accumulation on a farm or in a garden pot? Sodium is as important for plants as it is for humans because it regulates the osmotic pressure across cell walls which is how nutrients travel up a plants stem and into the budding part of the plant…whether it be fruit, vegetables, flowers, etc. When you are diluting and applying OceanSolution® as directed, all sodium will be used by plants in a beneficial manor and not accumulate in the surrounding soils. I am planting a vegetable garden and was wondering how much I need to apply, we are just getting ready to dig up the soil and put in the water lines. Should I spray the soil now or wait until I plant? It is best to apply the OceanSolution® mix (1 part per 100) as close to the roots as possible at planting time. OceanSolution ® is readily available for plants to assimilate because of its inorganic state. Unlike organic nutrients, such as composts or mulches, it does not need the microbes in the soil to breakdown its composition for plant use. I have a stable and raise my own horse hay on our 90 acre farm. Would your product help my timothy hay crop? And more importantly, do you have any idea if this would have the same calming effect on our horses as it did in the pastured cows as stated in the testimonials? When animals do not receive complete nutrition they root around and generally express other behavioral issues…especially when confined and cannot naturally forage. After applying OceanSolution® you will find them more docile, healthier and notice a marked improvement in the condition of their coats and hooves. This can be verified from other clients on our Testimonials page. I've been using OceanSolution to spray my wheat grass as it grows, but could it be used on the seeds before planting? What are your recommendations and why? By soaking your seeds in the OceanSolution® mix (1 part OceanSolution® to 100 parts pure water), they will absorb the nutrients delivering mineral rich seeds to begin growing your wheatgrass. For my raised beds, do I pour the mixed solution onto the soil and then plant? Because OceanSolution is in a form readily available for the roots of your plants to assimilate, it is more beneficial to apply the OceanSolution after you have planted and as close to the roots as possible. One other option that works very well is to set the roots in a container of OceanSolution mix (1 part OceanSolution to 100 parts Water) for about 20 minutes before planting. What is the correct dilution for OceanSolution® when using hydroponically? How would you recommend this product be used for a small home hydroponics system? Should I use any other fertilizer, such as an NPK mix? Do you sell it in small quantities to be used at home? In hydroponic gardening, because the plants are not able to obtain nutrients from the soil, the nutrient solution is the most important factor in the success or failure of a hydroponic system. Most fertilizers commonly available in garden centers do not contain all of the elements necessary for plant nutrition. OceanSolution® is a liquid solution extracted from the deep ocean that provides the essential nutrients in perfect balance for healthy seed and plant growth. The suggested dilution ratio is 1 part OceanSolution® to 100 parts pure water for most hydroponic operations. It is ideal to keep your nutrient solution between 1500 and 2000 ppm. Depending on the stage of plant development, some elements in the nutrient solution will be depleted more quickly than others. Because of this, it is important to change the nutrient solution each month. The old solution can be used to water other houseplants or outdoor plants. Also, make sure that the nutrient solution is kept at the original volume. As water evaporates from the nutrient solution, the solution becomes more concentrated and can burn plant roots. Add water only and not more OceanSolution® to raise the nutrient solution back to its original volume. A TDS meter is the best way to monitor your nutrient solution. In certain situations you would benefit by adding NPK. When you are dealing with hybrid plants, they are bred to demand excess NPK; however, open pollinated plants and seeds are aligned with nature and generally do not require extra NPK. OceanSolution® is available in both quart and gallon sizes for the home gardener. A quart size is $35.00 plus shipping and the gallon size is $80.00 plus shipping (sales tax will be applied to in-state orders). For your convenience you can contact us on our secure Contact page or call OceanGrown Distribution, 877.779. 4OGD (4643), and speak to a representative who will assist you in placing your order and answer any additional questions you may have.